In Tutorial 0 - Get it Running we created a read-only API with a single endpoint to list todos. There are many directions we can go to make this API more interesting, but one good place to start would be allowing some users to change data in addition to reading it. The previous tutorial created a web_anon role in the database with which to execute anonymous web requests. Let’s make a role called todo_user for users who authenticate with the API. This role will have the authority to do anything to the todo list. 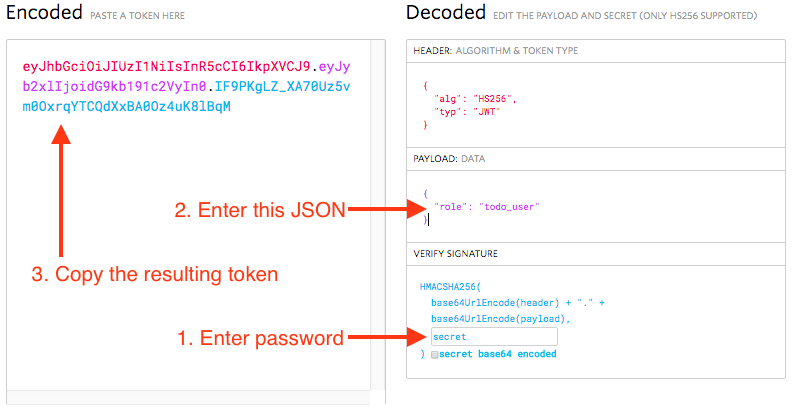 Clients authenticate with the API using JSON Web Tokens. These are JSON objects which are cryptographically signed using a password known to only us and the server. Because clients do not know the password, they cannot tamper with the contents of their tokens. PostgREST will detect counterfeit tokens and will reject them. Let’s create a password and provide it to PostgREST. Think of a nice long one, or use a tool to generate it. Your password must be at least 32 characters long. jwt-secret = "<the password you made>"
If the PostgREST server is still running from the previous tutorial, restart it to load the updated configuration file. Remember to fill in the password you generated rather than the word “secret”. After you have filled in the password and payload, the encoded data on the left will update. Copy the encoded token. While the token may look well obscured, it’s easy to reverse engineer the payload. The token is merely signed, not encrypted, so don’t put things inside that you don’t want a determined client to see. Back in the terminal, let’s use curl to add a todo. The request will include an HTTP header containing the authentication token. And now we have completed all three items in our todo list, so let’s set done to true for them all with a PATCH request. A request for the todos shows three of them, and all completed. Currently our authentication token is valid for all eternity. The server, as long as it continues using the same JWT password, will honor the token. It’s better policy to include an expiration timestamp for tokens using the exp claim. This is one of two JWT claims that PostgREST treats specially. Epoch time is defined as the number of seconds that have elapsed since 00:00:00 Coordinated Universal Time (UTC), January 1st 1970, minus the number of leap seconds that have taken place since then. Copy the updated token as before, and save it as a new environment variable. Even with token expiration there are times when you may want to immediately revoke access for a specific token. For instance, suppose you learn that a disgruntled employee is up to no good and his token is still valid. To revoke a specific token we need a way to tell it apart from others. Let’s add a custom email claim that matches the email of the client issued the token. PostgREST allows us to specify a stored procedure to run during attempted authentication. The function can do whatever it likes, including raising an exception to terminate the request. Restart PostgREST for the change to take effect. Next try making a request with our original token and then with the revoked one. © Copyright 2017, Joe Nelson Revision 0c39fdcd.